WR Darren Carrington is eligible to return to the Ducks on Saturday. Wide receiver Darren Carrington is eligible to return to the playing field on Saturday against Washington State after a six-game NCAA suspension. Carrington failed a drug test before the 2015 CFP national title game. It is not known whether or not the redshirt sophomore will play on Saturday after being cited by Eugene police on Sept. 26 for having an open container of alcohol. 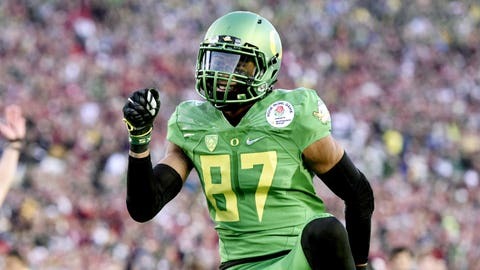 If Carrington does indeed play, it would be a huge boost to the Oregon offense. Carrington proved to be one of Oregon's most dynamic wide receivers in 2014. Despite not seeing the field yet this season, Carrington's coaches have been impressed with his attitude and his competitiveness. Lubick also went on to say that Carrington has helped Oregon's defense improve.